Having positive financial habits do not happen overnight. It takes constant control, discipline, and the right money practices. You need to make sure there is consistency – continuously performing these actions over and over again until they become second nature to you. When it comes to financial habits, it seems that Americans still have a lot to learn. According to reports, more consumers have admitted to increasing their expenses – although they said it was only temporary. Apart from that, only 59% of respondents said that they enjoy saving more than they do when spending. Obviously, we need to step it up if we really want to take our personal finances to the next level. Incorporating the right financial habits into your life will take some time. This is one of the reasons why you need to start identifying and acting on positive money habits as early as possible. You may not realize it but your parents could have already started and put you on the right track. They have been making you put any extra money in your piggy bank to help you get used to the habit of saving. Here are the 4 activities that you can use to help improve your positive financial habits. People really have a hard time sticking to their resolution to save more and spend less. You know why people have a hard time saving more? They have the wrong mindset about it. Most people believe that you should only save when you have extra money left. The priority is on debt obligations and daily expenses. It is true that you need to make sure you are able to meet your financial obligations every month. It is also important that you have enough funds for your daily needs like food, water, transportation, and clothing. However, this approach can be studied in a different light. While you should be making sure your present life is what you deserve, you also have to think about your future self. No one will save for your future but yourself. Think of it as a bill that you have to pay – only this time, your future self will be the one benefitting for it. It is also wrong to think that you can only start saving when you have a big amount left after expenses. The idea with incorporating positive financial habits into your routine is to prioritize it and do it consistently. That being said, you need to set an amount that you are comfortable with. Then, plan your expenses around it. You can start with a small amount and keep at it. Eventually, you will find that the amount has grown significantly. Part of the improvement process is to take a close look at the seemingly small but continuous expenses in your budget. You might think this is an insignificant move but what you fail to realize is that these small amounts will add up to quite a bit at the end of the month. Start with bad habits that you have been trying to shake off for the past few years. It can be anything from smoking to drinking or even a small amount you use to bet on the lottery. If you love to get a signature cup of coffee every morning on your way to work or even getting take-out before heading home, these small expenses add up. Try activities like brewing your own coffee at home every morning. You can even do some batch cooking at the start of the week so you can heat up food when you get home. These are part of positive financial habits because you get to save money. You might even learn how to cook and you can even use that skill to earn a little extra on the side. Now that we have mentioned earning a little extra on the side, let us focus on the hobbies that you can monetize. The idea is to do what you already love doing and earn from it. Much like the athletes you look up to. They get to play and get paid to do it. You can do that too. Identify the skill set you are good at and use that to your advantage. If you enjoy cooking and you are able to produce mouth-watering dishes, why not cook for family and friends during special occasions? If you are a talented graphic designer and can make beautiful art, why not offer your services to businesses in your area? It can be anything from designing flyers to signages or even some social media art. This is what is commonly referred to as income-positive hobbies. You get to do the things you already love doing and you get paid for it. Not only that, but you can also improve your skills along the way. When you are more skillful, you get the chance to ask for a bigger pay or even look for bigger opportunities that will give you more income. Soon, you might be able to make this your primary source of income. Finally, you also have to learn how to monitor your credit report – at least if you want to have positive financial habits. According to reports, most people know the basic concepts about credit scores. That means they understand the factors that will make their scores increase or decrease. Not only that, more and more people are checking their credit scores and keeping track of it. This is a habit that you need to have. It is very important for you to monitor your credit report because it gives you an idea about what you need to do in order to improve your financial situation. If you are accumulating too much debt, you might want to stop using credit for now. You should also enroll in a debt relief program to pay off your balance as quickly as you can. Credit monitoring can also minimize the threat of identity theft. If you spot it as soon as possible, you have a higher chance of proving that it was not your doing. Monitoring your credit report should not be too much of a problem because you can get free copies of your report – one each from the three major credit bureaus. This will give you an overall idea of your score. If you really want to improve your personal finances, you need to start working on getting more positive financial habits. It will bring you a couple of benefits. Encourages you to save more and spend less. This is probably a good benefit to have. It will help you be more responsible and smarter with your spending. The financial habits that you develop will keep you from spending on unnecessary things and will make you prioritize saving money. Keeps you from borrowing too much. We are not saying you should not use credit. But you need to learn how to use it wisely. 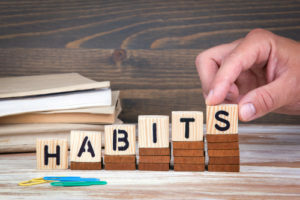 When you have the right habits, it will keep you from landing into a debt pit that is very hard to get out of. Helps you identify and grab financial opportunities. Finally, having positive financial habits will allow you to grab any opportunity that will improve your financial position. With better financial management skills, you can easily find the resources that you will need to take advantage of these opportunities as they come.